692 Commercial Real Estate and Properties in Sydney Western Suburbs are listed in 8 categories. We have 249 Offices for Sale & Lease , 194 Industrial Warehouses for Sale & Lease , 167 Retail Shops for Sale & Lease , 49 Development Lands for Sale & Lease , 21 Medical and Consulting Properties for Sale & Lease and 18 Showrooms for Sale & Lease . This facility at Smeaton Grange is Australia's first purpose built Incubator specifically designed for Small Business Development. Office Spaces are offered to new & growing ventures. Available now! Suite 13, 14, 15, 17 Industrial 6, 7, 11 (50sqm each) Sizes from 15sqm 50sqm Targeting businesses just getting off the ground and designed for small businesses wanting low risk entry into a commercial property. Licence Agreements are available as short as Month to month or up to 3 years. All utilities included (except for phone) Wi Fi available for use. Common boardroom Most suites with Air conditioning/ some furnished Common Reception area available for taking deliveries and arranging booking of boardroom. Business support available Common Kitchenette/lunchroom Common toilets with shower Contact Carly on 0433 332 782 or Laura 0447 436 801 to arrange an inspection. DISCLAIMER: Whilst we deem this information to be reliable the agent cannot guarantee its accuracy and accepts no responsibility for such. Interested persons should rely on their own enquiries. Combined Commercial are excited to offer this brand new development to the market for lease. Street facing shop onto Argyle Street. Shop 1: 38.39sqm Each shop will include own split system air con. Main Street exposure, onsite amenities and parking to rear. Due to be completed June 2019. Be quick to secure yours now! DISCLAIMER: Whilst we deem this information to be reliable the agent cannot guarantee its accuracy and accepts no responsibility for such. Interested persons should rely on their own enquiries. Opportunity Knocks! 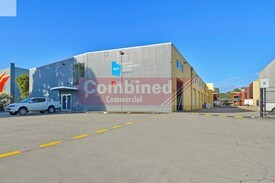 $1,800 per month GROSS in..
A great opportunity for the right lessee to establish their business in this incredibly large warehouse on the corner of Parramatta road Skarratt St Sth. Over 1300m2 of usable warehouse space with prime Parramatta Road exposure near major established business like Harvey Norman Nick Scali and located centrally between Parramatta CBD and Sydney CBD. Suits multiple uses including industry and retail. Large open area with side access. Currently being leased as a furniture showroom. For more information please contact Ray White Rentals on 0431 268 515 or John Shalala 0405 535 611. Alternatively contact our office and speak with one of our friendly staff. Be part of a dynamic Shopping Centre anchored by Woolworth's, Coles,Target, Chemist Warehouse and The Reject Shop. We are now offering an outstanding opportunity for an experienced Optometrist to lease a long established Optometry shop which is well serviced by the community. The shop is located opposite a new Medical & Diagnostic Imaging Centre within the Woolworths precinct in a busy regional shopping centre. 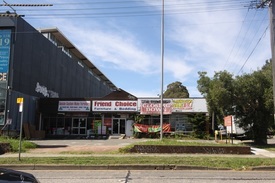 Neighbourhood Shop Location $1890 per month + GST + 2..
Shop situated in busy shopping strip Neighbourhood shop location Chinese takeaway equipment available Size 90 sqm approximately Lesee to pay 25% of outgoings Council rates, Water rates Insurance Opportunity knocks be quick!! Located in popular Smeaton Grange Industrial Area. This near new unit lends itself to a range of uses. 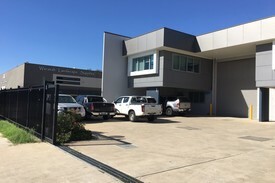 Some of the features include: Total area of 205sqm Mezzanine office with air con Container height roller door High Clearance Warehouse Onsite parking Call Carly or Laura to arrange an inspection. Office mezzanine of 75sqm located right in the heart of Appin industrial area. Inclusions are; Own bathroom, data cabling, powerpoints, shared kitchenette. 15 mins drive to Campbelltown, 30 mins drive to Wollongong. Only $250 per week + GST! Call Now to arrange an inspection. Exclusive Agents, Combined Commercial are excited to offer this premium industrial unit to the market for lease. New near tilt slab construction with approx. 7.5m 8.5m internal height and container height over sized electric roller door. Some of the features include; Disabled amenities in warehouse Fantastically designed wide access complex with an abundance of parking. Close proximity to M5 on and off ramps Ground floor tiles office/showroom with kitchenette, reverse cycle air conditioning and amenities. Professional carpeted mezzanine open plan office with separate kitchenette, amenities and ducted air conditioning. Total area including office/show room and mezzanine office approx 868sqm Available September 2019. Contact Carly on 0433 332 782 or Laura on 0447 436 801. Spectacular Views | Ideal Location | Cafes And Shops Nearby $83pw | 1 Person Workspac..
PROPERTY OVERVIEW $83pw Price incl. Serviced office space with professional vibe in Parramatta. Price incl. Internet, Rent, Electricity, Building Outgoings & All Utility Bills Flexi terms Recognised building Dedicated receptionist Central Location Other sizes available Avail NOW for short or long term rent 91 Phillip is an iconic building located in the heart of Parramatta's business district occupying one of the highest profile positions on the corner of Phillip and Smith Street. The building's prime position affords its fantastic access to services, amenities and transport. The building offers modern end of trip facilities (including showers, bike storage, lockers and change rooms), a ground floor cafe and a secure car park, making this a great opportunity for any business or individual who prioritises convenience! The advertised office space is perfect for a team of 1. If you need more or less space, we have over 30,000 furnished workspaces all over the world suitable for a team of 1 to 200+. Our award winning team offer a free service that will help you find the perfect solution for your needs, so reach out if you need more help. What you get for your weekly rent Free use of private office (or co working space) for up to 5 days per month Prestigious business address to put on your cards Mail handling service Professional call handling service Unlimited use of business lounges in 3000 locations worldwide Electricity usage included Flexible terms from 1 month 2 years Ability to bring your existing phone number over 10% discount on meeting room and office space bookings Signage board in foyer to highlight your business name Building features High speed lifts Car parking in building and surrounding areas Dedicated on site management team Adjacent to Buses and Trains 500m to Westfield shopping centre Close to Banks, restaurants and hotels 20kms to Sydney CBD 27kms to Sydney Airport WHO IS OFFICE HUB? Office Hub is Australia & New Zealand\'s No 1 small office space commercial real estate agency. We have the largest collection of shared spaces, coworking and serviced offices in Australia & New Zealand, perfect for 1 100 employees. Let us take you on a tour of all the spaces that fit your needs and budget. Our service is complimentary and we work for you and the landlord to negotiate the most competitive deal in the market. Let us show you how shared and serviced offices can be the perfect solution for your business. www.office hub.com.au www.office hub.co.nz Conditions apply A portion of the square meterage factors in access to shared space. Price includes any incentives offered. This is for new tenants only. Contemporary Office Space | Ideal Location | Modern Building $422pw | 4 Person Workspa..
PROPERTY OVERVIEW $422pw Price incl. Beautiful private office space for rent in an A Grade corporate building in Parramatta CBD. Newly fitted with premium fixtures and furniture, this designer workspace is a stunning choice for anyone in professional services. On offer is a single person private office with shared access to meeting rooms and kitchen facilities, available on flexible agreements starting from 1 month. The new fitout showcases the cutting edge of collaborative office design with every modern facility: an immaculate reception/waiting area and an impressive 12 seater boardroom with video conferencing. Well lit and faultlessly presented, this Parramatta CBD office space ensures professionals have the environment they need to succeed. All inclusive rate and flexible terms starting from 1 month. 80 George Street is located on the corner of George Street and Horwood Place in the core of Parramatta’s financial precinct. The A Grade 11 storey building has newly refurbished lifts, facade and foyer, paid car parking levels, a cafe and disabled facilities. 80 George Street also houses a Wilson car park for additional parking options. This prime location gives the chance to work in Parramatta’s key financial and business district while being only steps from Westfield and public transport links. An absolutely premium office space in Parramatta at an affordable price enquiries and tours welcome. The advertised office space is perfect for a team of 4. If you need more or less space, we have over 30,000 furnished workspaces all over the world suitable for a team of 1 to 200+. Our award winning team offer a free service that will help you find the perfect solution for your needs, so reach out if you need more help. What you get for your weekly rent , Access = Monday/Wednesday/Friday till 6pm | Tuesday/Thursday till 9pm | Saturday till 5pm | No access Sunday , Access to internal breakout areas , Building outgoings included , High speed internet , Electricity usage included , FREE use of the meeting rooms , One simple bill for everything related to your workspace , Regular cleaning Building features , Air conditioning , Car parking in building (Paid) , Car parking Street / Public Car Park (Paid) , Disabled access and facilities , Modern High Rise with fast lift access , New fit out , Onsite Cafe / Restaurant , Professional working environment 750m to Parramatta Station 650m to Westfield Parramatta Located in the heart of Parramatta CBD 550m to Parramatta Wharf 140m to Smith Street bus stops Who is Office Hub? Office Hub is the world\'s No.1 marketplace for office space. We have a huge global selection of coworking spaces, serviced offices and shared office spaces with flexible options to suit teams from 1 200 people. We\'ll take you on a tour of all the workspaces that fit your needs and work on your behalf to get the best price possible. We\'ll help you discover how shared office space can be the most beneficial and budget friendly solution for your business. www.office hub.com Conditions apply – the advertised price includes any incentives offered based on a 12 month agreement and is available to new tenants only. Please note that the rental rate may increase for a shorter rental period. A portion of the square meterage factors in access to shared space. Brightly Lit | Modern Commercial Building | Landmark Building $380pw | 5 Person Workspa..
PROPERTY OVERVIEW $380pw Price incl. Modern private offices for rent in Baulkham Hills complex. This cutting edge workspace has three spare offices for rent, sized for 2 3 people each, furnished with desks and set up with high speed internet. They are in a quiet and peaceful shared office where you won’t be interrupted and can enjoy abundant natural light and a contemporary environment. The well maintained workspace is regularly cleaned and accessible 24/7 with a kitchen and shared breakout areas. The only thing you need to bring is your chair! Then you can settle in, pay just one monthly bill for everything to do with the workspace and get back to growing your business without hassle or unforeseen overheads. Flexi terms available now and options to rent more than one private office if you have a larger team. Top notch office space in Baulkham Hills at an affordable price. This shared office is in one of Baulkham Hills’ best small office complexes. The cutting edge development offers modern amenities, disabled facilities, an impressive all glass facade and prominent roadside position to give your business both prestige and convenience. It harbours a close professional community with several small and medium sized businesses in an incredibly accessible location for any business operating in The Hills. Just moments from the M2, Norwest Business Park, Castle Hill and future rail links, and positioned opposite Stockland Mall, every commute and errand is made that much easier from this shared office space. The advertised office space is perfect for a team of 5. If you need more or less space, we have over 30,000 furnished workspaces all over the world suitable for a team of 1 to 200+. Our award winning team offer a free service that will help you find the perfect solution for your needs, so reach out if you need more help. What you get for your weekly rent , 2 X Private office suites , 24/7 Access , Access to internal breakout areas and kitchen facilities , A fully furnished office suite , Building outgoings included , Electricity usage included , Flexible lease with the ability to grow into bigger space , One simple bill for everything related to your workspace , Plug and play furnished workspace , Regular cleaning , Secure high speed Internet Building features , Abundance of natural light , Air conditioning , Boutique low rise buidling , Car parking Street (Free) , Direct access to buses , Disabled access and facilities , Gym and fitness centre close by , Professional working environment , Retail and shopping malls nearby , Taxi / Uber stand close to building 92m to Stockland Baulkham Hills Shopping Centre 85m to Anytime Fitness 2.7km to M2 Motorway (Windsor Road junction) 5.4km to Norwest Business Park 110m to Old Northern Road Bus Interchange Who is Office Hub? Office Hub is the world\'s No.1 marketplace for office space. We have a huge global selection of coworking spaces, serviced offices and shared office spaces with flexible options to suit teams from 1 200 people. We\'ll take you on a tour of all the workspaces that fit your needs and work on your behalf to get the best price possible. We\'ll help you discover how shared office space can be the most beneficial and budget friendly solution for your business. www.office hub.com Conditions apply – the advertised price includes any incentives offered based on a 12 month agreement and is available to new tenants only. Please note that the rental rate may increase for a shorter rental period. A portion of the square meterage factors in access to shared space. Creative Space | Natural Light | Fitted And Furnished $445pw | 5 Person Workspa..
PROPERTY OVERVIEW $445pw Price incl. 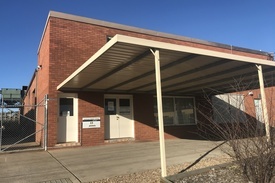 Office space for rent within an innovative Allied Health practice, available to practitioners, therapists and small businesses seeking flexible office space in Rydalmere. There are several consulting rooms and an open plan coworking area in this health practice – rent one of the spacious private offices so you can consult with clients or work in peace, or choose a coworking desk as a more affordable option. The lovely modern building is extremely well kept and harbours a peaceful light filled environment conducive to quiet professional work and client satisfaction. These spaces can be furnished or unfurnished according to your preference, and they come with business grade Wi Fi, a boardroom for meetings and a welcoming reception area with professional staff running the show. Convenient bonuses at this health practice include a small gym, laundry facilities, a kitchen and extra storage. Whether you’re looking for consulting space, a private office or a coworking desk, Greater Sydney’s most innovative multidisciplinary allied health practice would love to accommodate. Please enquire to discuss or book a tour to view at a time that suits you. This health practice sits on the ground floor of a large commercial building in a peaceful Rydalmere location. Positioned on the A6 but set back from the road, it promotes a sense of health and wellness and feels in perfect harmony with the surrounding nature and greenery. There is a large car park at the entrance with free allocated parking for tenants and plenty of spaces for clients, as well as fully equipped kitchen, bathroom and laundry facilities. It’s a two minute drive to Victoria Road and James Ruse Drive while Parramatta CBD is only five minutes’ away to provide you and your clients with excellent convenience. The advertised office space is perfect for a team of 5. If you need more or less space, we have over 30,000 furnished workspaces all over the world suitable for a team of 1 to 200+. Our award winning team offer a free service that will help you find the perfect solution for your needs, so reach out if you need more help. What you get for your weekly rent , 24/7 Access , 2 seperate offices , Access to internal breakout areas , Access to kitchen facilities , Building outgoings included , Commercial grade internet (Free) , Dedicated receptionist to manage your calls and greet your guests , Electricity usage included , FREE use of the meeting rooms , One simple bill for everything related to your workspace , Plug and play furnished workspace , Regular cleaning Building features , Abundance of natural light , Air conditioning , Boutique low rise building , Car parking in building (Free) , Company Branding at reception , Daycare only minutes away , Dedicated men and ladies bathrooms , Direct access to buses , Disabled access and facilities , End of trip facilities e.g showers, bike racks , Private offices and dedicated desks available , Retail and shopping malls nearby Opposite Marri Badoo Reserve & Subiaco Creek 450m to bus stop at Victoria Road (Bus 520, 523, 525, M52, N81) 950m to local shops, cafes and restaurants 5.7km to Parramatta CBD Who is Office Hub? Office Hub is the world\'s No.1 marketplace for office space. We have a huge global selection of coworking spaces, serviced offices and shared office spaces with flexible options to suit teams from 1 200 people. We\'ll take you on a tour of all the workspaces that fit your needs and work on your behalf to get the best price possible. We\'ll help you discover how shared office space can be the most beneficial and budget friendly solution for your business. www.office hub.com Conditions apply – the advertised price includes any incentives offered based on a 12 month agreement and is available to new tenants only. Please note that the rental rate may increase for a shorter rental period. A portion of the square meterage factors in access to shared space. Exclusive Agents, Combined Commercial are excited to offer this property to the market for lease. This studio includes separate metered electricity and individually controlled ducted air conditioning. Intercom system, access to common board rooms, lounge/waiting areas, kitchenette and male/female/disabled amenities. There is loads of parking onsite and fantastic cafe to back. Approx 109sqm. + additional mezzanine space available by negotiation. Currently occupied by a (D.A approved) Hair Dressing Salon existing fit out available for purchase. The studio lends itself to many usages such as office, retail and showroom. Contact Carly Lane or Laura Wright today to arrange an inspection. Vacant Industrial Land ready for Pre Lease Opportunities. Call and tell us what your company requires. Situated in Central Hills Business Park approx. 45 minutes South West of Sydney. Surrounded by massive growth with expected 110,000 homes planned and already underway in the catchment of the Business Park. We can cater to your requirements developments anywhere from 7000sqm up to 14000sqm+. Zoning is IN1 General Industrial M5 & M7 only a short distance. Leppington Rail Link only 10km north. Call Michelle 0425 34 88 33 for more information. DISCLAIMER: Whilst we deem this information to be reliable the agent cannot guarantee its accuracy and accepts no responsibility for such. Interested persons should rely on their own enquiries. Exclusive Agents at Combined Commercial are pleased to offer this first floor office to you. The space has plenty to offer, including: Brand new carpet Freshly painted Air conditioning Combination of three offices, with kitchen and a bathroom New windows and blinds Single access entry Separate electricity meter Water usage included Size is subject to final survey. Call Laura 0447 436 801 DISCLAIMER: Whilst we deem this information to be reliable the agent cannot guarantee its accuracy and accepts no responsibility for such. Interested persons should rely on their own enquiries. Professional commercial office suites available for lease located across from Ingleburn Station. Various options available such as; Suite 1 136sqm Suite 2 112sqm Suite 3 240sqm Suite 4 195sqm Suite 5 88sqm Option to combined suites for bigger sizes. Building has recently been painted externally. Open plan layout, ducted air conditioning, phone lines, etc. Amenities onsite. Pricelist available. Call for more information or to arrange an inspection. DISCLAIMER: Whilst we deem this information to be reliable the agent cannot guarantee its accuracy and accepts no responsibility for such. Interested persons should rely on their own enquiries. This facility at Smeaton Grange is Australia's first purpose built Incubator specifically designed for Small Business Development. Office Spaces are offered to new & growing ventures. Available now! Suite 13, 14, 15, 17 Sizes from 15sqm 45sqm Targeting businesses just getting off the ground and designed for small businesses wanting low risk entry into a commercial property. Licence Agreements are available as short as Month to month or up to 3 years. All utilities included (except for phone) Wi Fi available for use. Common boardroom Most suites with Air conditioning/ some furnished Common Reception area available for taking deliveries and arranging booking of boardroom. Business support available Common Kitchenette/lunchroom Common toilets with shower Contact Carly on 0433 332 782 or Laura 0447 436 801 to arrange an inspection. DISCLAIMER: Whilst we deem this information to be reliable the agent cannot guarantee its accuracy and accepts no responsibility for such. Interested persons should rely on their own enquiries.